Diego Maradona roared and gesticulated through every anguished second of Argentina's rollercoaster World Cup victory over Nigeria on Tuesday before triggering alarm with a health scare after the final whistle. Lionel Messi may have dominated the on-field action in Saint Petersburg, but from his VIP box in the stands Maradona reigned supreme as the undisputed centre of attention. The 57-year-old football legend started the evening dancing playfully with a female Nigeria fan, saluting and waving to well-wishers applauding him in the moments before kick-off. Throughout Argentina's nerve-shredding 2-1 victory, which secured the South American giants' passage into the last 16, the host broadcaster television feed regularly cut to images of Maradona as the tension mounted. When Messi gave Argentina the lead early in the first half, Maradona screamed his delight, crossing his hands across his chest and gazing to the heavens. The 1986 World Cup-winner looked increasingly frazzled as the game wore on, at one stage slumped forward in his seat just before half-time. 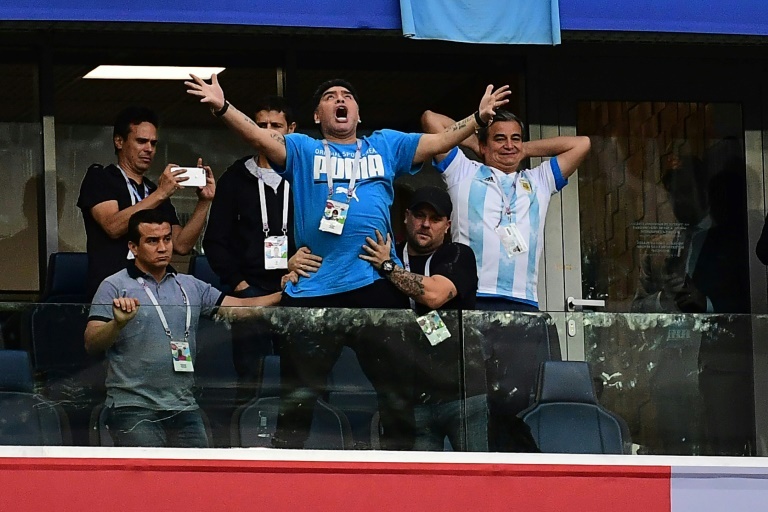 After Nigeria made it 1-1 from the penalty spot after the break -- a scoreline that would have sent Argentina crashing out of the tournament -- Maradona grew increasingly distraught. By the 80th minute he sat with his hands covering his face, unable to watch as the seconds ticked towards a footballing calamity for Argentina. Yet when Marcos Rojo swept in a sumptuous volley with four minutes remaining, Maradona exploded with emotion, shouting an obscene insult before raising the middle finger of each hand in the direction of the pitch. But the jubilation turned to alarm soon after the final whistle when a video emerged on social media of Maradona walking with difficulty and being guided into the dining room of the VIP section by two friends. Argentina media reported that Maradona had suffered a spike in his blood pressure. Argentinian newspaper Ole later reported that Maradona was able to walk and had gone to his hotel. Maradona has had a series of health problems, including cocaine addiction. In 2007 he reportedly came close to death after being admitted to a hospital in Buenos Aires to be treated for hepatitis and substance abuse. As images of him being treated by paramedics went viral late Tuesday, some commentators expressed concern about his health. English former footballer turned broadcaster Stan Collymore said he believed it was time Maradona "took a break from football." "The guy had serious heart issues years ago, yet FIFA and sponsors keep indulging him and he himself," Collymore wrote on Twitter, above a widely shared image of Maradona being tended to by paramedics. "Whatever you think of him, anyone deserves decent health," Collymore added. BBC broadcaster Mark Chapman said Maradona's plight was "sad." "Maradona was the greatest footballer of my youth," Chapman wrote on Twitter. "Now he appears to be the joke cutaway of choice for tv directors. Not that he helps himself but sad."